NASHVILLE, Tenn. (May 14, 2015) – Since the start of his music career, GRAMMY-winning country music star Lee Greenwood has released more than twenty major-label albums, celebrated seven No. 1 hit songs and captivated a nation for over three decades with his iconic stars and stripes embellished anthem, “God Bless The U.S.A.” Today, he announces his plans to embark on a national tour this summer, spanning the country from sea to shining sea. Beginning May 17 in Vermilion, Ohio, Greenwood will kick off a season full of headlining performances infused with both patriotic vigor and sheer musical ingenuity. Critics have long heralded his smoky, soulful voice and praised his diverse musical talent at live shows, which he showcases all the way from the microphone, to the keyboard, to the saxophone. He’ll appear at a variety of venues including fairs, festivals, theaters and casinos, as well as major events across the nation including: the Coca Cola 600 NASCAR race at Charlotte Motor Speedway, Harrah’s Casino in Biloxi, Miss., The Lyric Theatre in Stuart, Fla., and the Kennedy Center for Performing Arts in our nation’s capitol. For a full list of upcoming tour dates, visit www.leegreenwood.com. 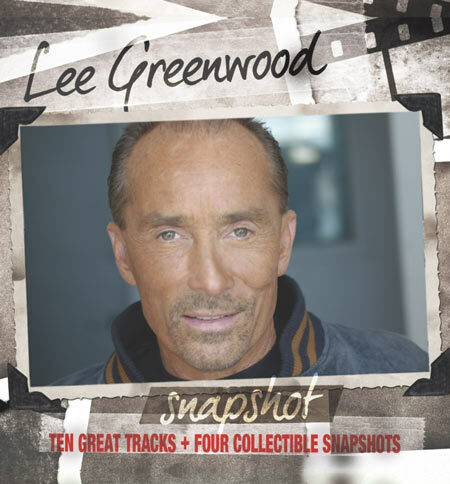 In addition to his upcoming national tour, Greenwood celebrates a new album compilation, Snapshot: Lee Greenwood, now available in select retail stores. Greenwood joins legendary artists like Merle Haggard, Conway Twitty, Willie Nelson, Patsy Cline, T. Graham Brown, Roger Miller and many more in releasing an album as part of the Snapshot series from Hickory Records, a division of Sony RED distribution. Snapshot: Lee Greenwood features ten memorable tracks including classics like “Ring On Her Finger, Time On Her Hands,” “Dixie Road,” “Somebody’s Gonna Love You,” “Hearts Aren’t Made To Break, They’re Made To Love,” “Time After Time,” and four collectible snapshot photos. It is available now on iTunes, Amazon and at select retail stores. Greenwood is also slated to release his first-ever children’s book, Proud To Be An American, encouraging patriotism in our nation’s youngest generation, which will be backed by a major national press launch and media tour over the Fourth of July weekend. “After more than 30 years of singing ‘God Bless the U.S.A,” I’ve watched my song be passed down to three generations. Given the unrest in America today, I felt it was time to give the next generation something to hold and read, that tells, in a very simple way, why it’s good to be an American and why we should be proud of it,” Greenwood said. The fully illustrated hardback paints a childlike picture of America in colorful snapshots that teach geography and show on several pages the portrait of American soldiers. The book is available this May at LeeGreenwood.com, Barnes & Noble, LifeWay Christian Stores, Books-A-Million, Family Christian Stores and other select bookstores, and also includes a download for a never-before-heard version of “God Bless The U.S.A.” It is published by Clovercroft Publishing. 12-13 | Vincennes, Ind. | Red Skelton Performing Arts CenterFor more information on Lee Greenwood and his upcoming tour dates, please visit www.leegreenwood.com.